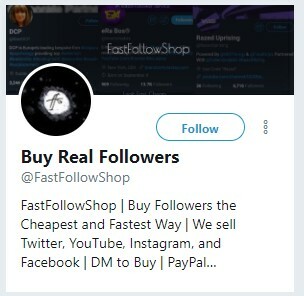 Is There Room at the Table for the Fake Followers Among Us? « Midlife Crisis Crossover! An app called Twitter Audit tells me only four bots are leaching dignity from my Twitter account even though Ive never paid a dime for any. or micropayments. And there are other ways to look more prestigious than you are. I’ve given my thoughts previously on the flaws in the “I’ll follow you if you follow me!” system of conditional relationships, but other options to puff ourselves up are all around if you know where to look. In fact, I have one installed right here on MCC. We all have our hypocrisies. I carry one in plain sight. No one’s ever asked me about it. If it’s ever influenced anyone’s opinion of me, they’ve never told me so. If you view MCC exclusively on your phone, odds are you may never have scrolled down far enough to see the widgets at the bottom of the page. 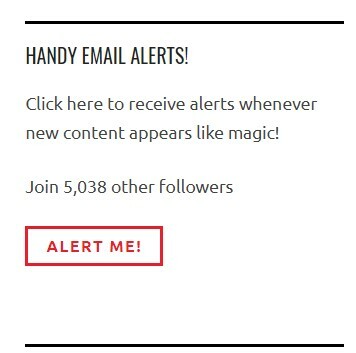 Desktop PC users can look over to the right and see the offending widget in question: the “Handy Email Alerts!” section. NOTE: This is a screen shot, not the actual widget. Clicking a picture of a button will do you little good. As of this writing the alleged total MCC follower count stands at 5,038. It may or may not sound faintly impressive to a few folks, and is certainly pitiable to others. I’m not jealous, just acknowledging my low place in the pecking order. Even the most math-challenged reader should be able to detect a discrepancy between that four-digit figure and the average number of Likes and comments on any given entry. If you need a few minutes to scroll backward through some entries and collect data for your scientific analysis, that’s fine. I’ll wait here. Go forth and click on as many entries as you wish. Maybe even read a few? …you see what I mean? Where are those faithful 5000 on any given day? Real talk: that number is ridiculously loaded. It does count actual Things, but not what you think it counts. It’s nothing I’ve consciously manipulated or inflated through my own efforts. I’ve never created sock-puppet accounts or surrounded myself with a veritable army of invisible friends or illegitimate descendants of George Glass. I promise I’ve never paid a dime to affect anything of the sort. Frankly, I’ve never been that bored or desperate. The fact remains that not all of my followers are “real”. I take some pride and lose some humility in noting that at least I didn’t pay for any of them, not like that one guy who once sat across the room from Roger Ebert on TV and earned the most pained responses to his feeble defenses of “popcorn films”. Among other issues and double standards noticeable from this list, the most obvious question raised is: why even bother showing off that optional feature on the widget if it’s as hollow as I think it is? It has an “off” switch. Whither integrity? Honest answer: I’m not consciously sure. My way of keeping a nominal token in The Game, I guess. Putting on a raggedy domino mask labeled “BLOGGER” across the top and trying to blend in with everyone else who either has a true fan base or merely caters to a roster of digital simulacra. All I really know in this moment is it’s bothered me for years, long before the NYT exposé. I think I’ve finally discovered a rationalization that’ll placate me for now, though. It’s not a real-time census of Everyone Who Reads MCC. Man, if only. No, it’s more like a rolling counter of everyone who ever acknowledged my existence on any level here on this site, even including bots. But hey, they were bots who validated me in split-second increments, albeit in their own emotionless way. That’s more than I can say for some family members, if I think long and hard and pettily enough. But I’m not sending the bots a Christmas card. And I’m definitely not tipping them. Sometimes I wish my numbers were more real as well. Lately, I’ve enjoyed using that new function on WordPress which allows me to remove followers. Some are easy “CallGirlsfromDelhi” and “RentalVacHomes”, but others are harder to divine. Still, I like having just that little extra bit of control, even if it is all a shell game. I had no idea they’d added that functionality. Thanks for letting me know! Maybe with some time and curation I can get a little closer to an honest follower count.